Pyramid solitaire is a fun and popular solitaire game that begins with the cards dealt in the shape of a pyramid or triangle. It’s not always possible to complete this Solitaire game. How often you complete the game depends largely on the random deal of the cards, as well as the strategy you use in removing cards. 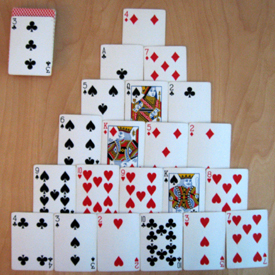 Shuffle the cards then deal out 21 cards in the shape of a pyramid with six rows, as shown in the photo. Place the remaining 31 cards in a pile face-down, beside the pyramid. These cards are called the stock. This diagram shows the starting layout for Pyramid Solitaire. The object of the game is to remove all the cards from the pyramid, the stock pile and the waste pile, and place all 52 cards in the discard pile. You may remove cards one at a time or in pairs that add up to 13. Kings count as 13, queens as 12, jacks as 11, and aces as 1. All other cards count as their face value. You may only remove cards that are totally exposed in the pyramid or the top card of the stock pile or the waste pile. That means that, to start the game, you may only remove cards in the bottom row of the pyramid or the top card from the stock pile. To expose other cards and make them available you must first remove both cards that cover it. When you remove cards, put them in a separate discard pile. Once in the discard pile, these cards are no longer in play. Suit and color are not important in pyramid solitaire. Turn over the top card from the stock pile at the start of the game. If you can’t play the top card of the stock pile, and you have run out of moves, move it to the waste pile, face-up. The top, exposed card in the waste pile is available for play. After you have moved all the cards from the stock pile into the waste pile, you may move the cards in the waste pile back to the stock pile to replenish it. You may do this up to three times. Do not shuffle the cards when you put them back in the stock pile. You win the game if you successfully remove all cards from the pyramid, the stock pile and the waste pile into the discard pile. To play this variation, begin the game with a seven-row pyramid containing 28 cards, instead of a six-row pyramid. The remaining 24 cards go to the stock pile. In this game variation, you may only go through the stock pile once. That means that after all cards have been moved from the stock to the waste pile, you may not move the cards in the waste pile back to the stock pile. The game is over after one pass through the stock. In addition to the pyramid, you may wish to deal an additional row of exposed cards separate from the pyramid. This is called a reserve row. These cards are exposed and immediately available for play to start the game. For further clarification of these rules in action, watch the video below.